Getting stuck on a desert island by yourself might be as lonely as it gets. With no connection from the outside world and nothing but the island’s flora and fauna to keep you amused, things can also get boring and routine. Let’s face it, no matter how misanthropic a person can get, they still need some kind of communication with another living human being. That’s where a message in a bottle comes in handy. At a crucial point, when all seems to be lost, the stranded person comes upon a message in a bottle, maintaining hope that someone out there will find them. To commemorate the special nature of receiving a message in a bottle (and also do away with the island and the part about being stranded), Firebox is offering a Message in a Bottle USB flash drive to share with your friends and loved ones. Firebox’s Message in a Bottle USB flash drive is a remarkable reinterpretation of the idea surrounding the original message in a bottle. Since we live in an increasingly technological world, the flash drive concept both incorporates and updates the idea of a message in a bottle. The components that our expectations have built up over years of reinforcement still remain. 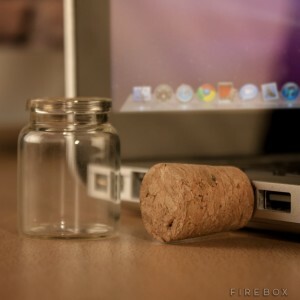 The USB flash drive is made from a cork stopper and a miniature, clear blown glass bottle, both of which serve as a protective cap and casing. And instead of a rolled up piece of paper stuffed in the bottle, what you find is a USB connector. The USB flash drive has a storage capacity of 4 GB; that’s more than a piece of paper could ever contain, so you don’t have to worry about limiting yourself. The Message in a Bottle USB flash drive would make a perfect gift or, even better, gift container. It’s fairly discrete in size, measuring only two inches high and one inch in diameter. Send it to a special someone who you think may enjoy an advanced, updated form of the old “stranded on an island” standby. Just try to refrain from sending this gift off the traditional way. Ocean currents are not at all predictable, and Firebox’s USB flash drive is not at all waterproof. The Message in a Bottle USB flash drive runs with USB 2.0 bus specifications and possesses platform compatibility with Windows (98 and later), Mac (OS X and later), and Linux (Kernel 2.4 and later). 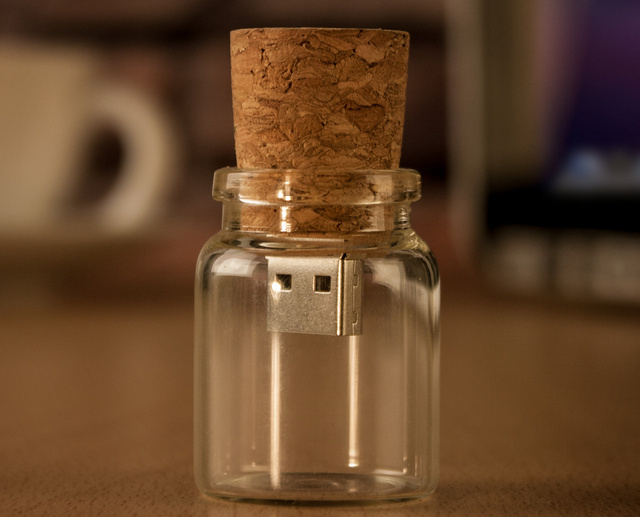 Firebox’s Message in a Bottle USB flash drive is available on Firebox’s website for $28. This entry was posted in Custom Shaped USBs and tagged cork usb drive, custom shaped usb drive, Custom USB flash drive, Firebox, message in a bottle, USB drive. Bookmark the permalink.